Or they will be later. This morning my feet have been pounding the road (my first good run- or any run at all- since I had strep throat in October. I have a patient friend who came to get me at 5:50 (sharp!) and mapped out an easy 3 miles around the neighborhood), waiting in the car inspection line, tapping to 1940s country/bluegrass, and tidying up the house. After I go get the kiddo from his morning pre-K program, I'll go upstairs to trim the dozen-plus pieces I made yesterday afternoon. I happily dedicated Monday morning to mowing, edging, pruning, and clearing the garden from the last of its winter cloak. I hope your day is productive, too! Oh, and yes, I almost always throw barefoot. It seems like I get better traction on the pedal when I'm not wearing shoes ('cause that traction on the pedal is oh so important, you know?). I'm sure if I used a kick wheel I'd want shoes on, but I love my electric model. 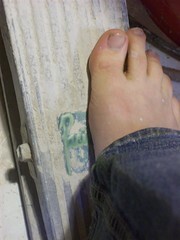 Also I tend to track less clay dust down the stairs when I'm shoeless.